Happy March! I love to be the first to say that to people! It's kind of a race around the house to do that first. I usually win. Especially as the kids grow older. How come I never grew out of it? I love May! I love doing May baskets! I never grew out of that, either. I think being childlike makes life a lot more fun. I'll never grow out of my love for cookies and milk, or 'nap time' either! This morning I have to get David to school early. While I'm there, I'm going to take Kilchis for a walk around the high school track. Think I'll make it the entire way? I think so! Back from my walk, and yes, I made it all the way. It's AFTER the track that I had trouble! The track is a long ways from my truck! It's interesting the panicky feeling I get, when my legs start to tingle and feel like they are going to give out. I pass people hurrying to their school classes and practice in my mind what I might say if I need to. "Can you help me find a place to sit down?" Or, do I just sit there on the freezing ground myself? The thought helps me to give them a smile and a breathless "Hi!" I must look healthy, exercising and all. As I make progress, I begin to panic even more, and my practiced words go to, "Help! Help meeee! I've just had heart surgery and I feel like I need another one!" But... I made it to the car... feet tingling, hands frozen, out of breath... but I made it! Still smiling, too! I'm listening to a CD now that I wrote! A very nice member, Tom, made me a CD of a couple of my midi recordings. Kind of fun! I can't believe that is me! Did I write those? It's been so long. A different lifetime ago. Yesterday I played for an hour in the morning. Yes, it's been so long, and my finger dexterity reminded me of that! It won't be long, though, until I can get them in shape. My finger's memory is far better than my own. Stan's new column is up. Click here to find it. We've changed to once a month until I get my health on an even keel. Off I go. I have to go to Portland for another round of cardiology tests. I'm going to glow green if they put much more radiation in me, for cat scans. Who knows, maybe that will help me catch bigger and/or more fish? They'll see the glow and smell home, upriver where the nuclear plant is. I'm going to have a good day. I'm going to enjoy the sunshine! (In between appointments!) It's a good day, right? It's a new day! I got up at 5, and left for Portland at 7 AM. First doctor's appointment at 9. Andrew and I both had echocardiograms. I haven't heard the results of mine, but Andrew's aortic root size has grown. That's not what we wanted to hear. Then, I went to see the cardiologist, after Andrew saw him. We kind of toggle back and fourth. Andrew has his tests, I go to the doctor, and then we reverse. They found an aneurysm in my upper leg where they did the heart catheter last month. It must be removed, surgically... next week! Another surgery! ARGH! OK... I'll do it. I don't have a choice. They are either going to inject something called Thrombin in it to try to get it to clot, or just do a surgery to remove it. Not sure which, yet. One, I go to sleep, the other is done while I'm semi awake. My coumadin, of course, is a risk factor in both. OK, so afterwards, (four hours after!) we went to lunch with my sister. Now, that was fun! I got home around 3:00 PM to a letter from Stanford Hospital. The bill was 120K... But hey! Insurance paid all but 54K of it! 54 thousand?!?! I sure hope insurance isn't done paying on it, yet! YIKES! Then, I found out that ifish was broken. I couldn't believe it, but we had tons of MySQL errors. When it finally got fixed, we were missing members! Whole members and all of their posts were missing. Thank Goodness, my tech was able to magically bring them back from the dead. Dinner was not prepared, and argh... Believe me, it was a tough day! But today? Today is going to be better! I have three doctor's appointments today. They are all going to be good. I promise. It's a bright, sunshiny day. Last night, Andrew said, "When I wake up, it will be like Christmas!" Why? Because today, believe it or not, we are getting Charter digital and wireless internet! Wow! Do you know how long I have run ifish from a dial up connection? For nearly seven years! I will be able to run a laptop out on my deck in the sunshine! On the river, while I hook a fish! Upstairs in bed, when I'm tired! No more click and wait, wait, wait! Instant screens of satisfaction! You know, sometimes I find it difficult to end my work day. That's the problem with home offices. It's very difficult to not be pulled back to work. Especially if I want to browse the internet to shop, or to read, or just relax. I seem to get pulled back into the ifish drama. It's going to be even more difficult to close my office doors if the internet follows me around! Still, I am happy for the opportunity. I cannot believe that it is available. For years they have told me it is available, only to have them call later, and tell me they had made a mistake. So, part of me won't believe it until they actually show up and show me it works! Last evening, as I rounded the corner to start the drive down into the canyon, I looked up at the mountains that surround my home. All of the trees still had their dusky winter colors. There were very few green trees, as happens in the spring time. Yet, the air around me was so spring like! I have to wonder how much of the gray brown colors are that terrible and destructive spruce disease, and how much is just leafless trees, yet to catch up with the blooming of daffodils, and the wonderful smell of my blooming daphne bush. Every day as I scan the beautiful and not quite lush forest around me, I shudder to think that they might log the mountains that keep me feeling snug, and cradled in the forest. So far we have been extremely lucky. Although we see loaded log trucks on our roads nearly daily, so far, no signs of bald peaks around us. The only sign of logging that I have noticed, are the lack of deer and fawn that used to frequent our meadow. Sometimes, large herds of elk would come down the mountain and surprise me in the morning. I'll never forget my Easter Elk! As I began to hide eggs and candy for the kids in the wet stillness of that spring morning, I was startled and jarred awake by a huge herd, grazing before me. I stood there, basket in hand, and could not move. It was the Easter Elk! I've since looked for them every Easter morning, without luck. Since they began logging the opposite hillside, the deer and elk have gone North, instead of South, and they are boldly missing from our meadow. Still, I know they pass through here on occasion. I find their footprints in the sand on the river. They just aren't as frequent as they were. Sigh. I have surgery sometime next week. It seems like it never ends. I have an aneurysm in my leg that must be removed. I just have to take a deep breath and continue on with my life, however it happens. People say to me how strong they think I am. It's not strength. It's just the way it is, and anyone who would experience it would just learn to do what they have to do. What I have to do, is to have surgery. One thing you can do, however, to make it easier... is to smile alot. Easter Elk do that for me. Pat McManus books do that for me. Living on the river does that for me. Gazing up on the mountainside and feeling cradled by the trees does that for me. Fresh sandshrimp on a hook, tossed into the ever more gentle current of spring does that for me. The other day, a sharp pull of Bill's rod nearly pulled his rod from an forked stick. I lurched for it, from my lazy sitting position and shrieked, "Bill! Fish on!" I forgot about the weakness of my aorta. I forgot that I was sore from head to toe, and I was laughing as I saved his rod from a dunking. That did it for me, too! As I look out my window, I notice the dewy grass of the meadow all dressed in the trees shadows. I have to squint at the sunshine, which lights up the winter colored trees on the mountain, in contrast. I hear the song, "How Great thou Art" and that makes me really smile. ...and of course, there is always digital cable internet. It seems like an awkward time. I'm getting better, but I'm still not well. However, since I'm doing some things, and looking most like a normal person, again, (not always hunched over, looking like I'm in pain!) people assume that I'm "all better." Especially my kids. "Mom, what's to eat around here? Mom, can you take me to Brian's and then to the school, and by the way, I need another pair of pants. I won't be home tonight till 11:30, so please wait up for me!" My batteries just don't hold a charge yet. In fact, it's alot like using one of those remote control cars with rechargeable batteries. I only have a few hours of use before I have to plug in again. But it sure is fun while I'm running! I wake up chipper most days and buzz around doing wheelies, but I expire pretty darn fast! Then, what sounds best is TV and bed for a while. It seems like people on ifish see and expect the same thing. Since I am well now, can I please "edit this picture, send me my password, put up the ad we put off and bill me, accordingly?" I could do that if only I could get time and energy to cancel my extra phone line since I got cable, and my two dial up accounts, too... and switch all programs over so that they don't dial up, anymore! As always in life there is just too much darn stuff to do! Yesterday I went trout fishing on Lake Lytle. The weather was beautiful, but no fish were biting. Do you know how long it's been, since I have felt a fish? Speaking of things to do... I have been thinking. It hit me at Stanford University like a brick. I thought of it first, when I sat up all night in pain, literally crying for pain meds, and a kleenex to wipe my tears. I wasn't given either, and I was treated poorly by the "caretaker" on call. The day after I was released, I came back for tests. I waited forever for my test, and I was extremely tired and emotional. I couldn't believe I had to wait so long. I was still in pain and very uncomfortable, and I wanted to go home! Down the hall, I noticed a lady about my age, sitting abandoned in a wheelchair. She was asking for help to get back to her room, and no one was coming to her aid. A while later, she broke down in sobs. She kept trying to tell people that she had cancer, and had lost control of her bladder. She was shivering cold, and wet. My heart sunk. I wheeled myself to the check clerk and asked why she wasn't getting help. "I'll dial the nurse on call." More time expired. Fifteen minutes? Thirty? I watched this poor lady sit unattended or cared for, for a long time. I wanted to help, but what could I do, but keep bothering the desk clerk. I was also in a wheelchair, and very weak. That's when it hit me. I've never been so overwhelmed with something I wanted to do in my life, and it keeps coming back to haunt me. I want to either be a volunteer at a hospital, or have a job in a hospital, caring for people like this. People who have no one. No "sister Teri" to be with her, like I did. No one to sit with me, and run their fingers through her hair when she is tired and in pain. No one to hold her hand, when she is afraid. No one to bring her Kleenex when she has lost all hope. No one to bring her an ice cream bar when she is tired of the food at the hospital. I want to be there for those people. I can think of nothing more fulfilling or needed in the world, and I can't wait to get better, so that I can do just that. I don't know that there is much of a need at Tillamook Hospital, so I think I'll be driving to Portland to volunteer. I don't know where to start looking for that type of job/volunteer work, but there has to be a place. I have to do this. It's necessary, and there are people out there, that I could help. I've been there. I know what it feels like to be alone. I also know what it feels like when someone shows up on your behalf. No, I wouldn't abandon ifish... I help people here, too! But... I just have to do this, too. I can't wait till I feel good enough to start! I just have to wait until my batteries hold a charge a bit longer, and I'm off! Let's see. I have surgery to schedule today, and pre surgery tests... I have ifish to do, and bills, regular house bills, and ifish bills. I have bank deposits, and I have to go to the Post Office. I have physical therapy, and house cleaning to do. Which ONE am I going to get done, today? I think I'll just go walk Kilchis on the river. I was laying in bed, resting yesterday, feeling quite comfortable. I set down my Pat McManus book. I stared out at the river. Everything was good. I began to think about my upcoming surgery. "Let's see... When do I have to go?" TOMORROW! Oh my gosh! Panic set in! I have to leave today, because I can't drive in the dark, and I have to check in at 6:30 tomorrow! Yikes! I had to make some phone calls to set things up, and darnit anyhow, the phone didn't work. I had my dial up line cancelled, and somehow Sprint disconnected the wrong line. I began to hug Kilchis a little closer, and alot more frequently through out the day. Kilchis doesn't want me to go. Of course, he doesn't want my aneurysm to pop, either... so I'm going! Why on earth is my stomach churning? Is it nerves, or is it the flu? Regardless, I'm supposed to report it. I hope it's nerves. I do not want surgery, but if it has to be, then I don't want to put it off! When the phone gets back online, I'll call my surgeon. Off I go-- See you when I get back! P.S. I have been waiting and watching, day by day, for the return of my Goldfinch. They had better not show up when I am out of town! Well, here I am again... back from surgery. You know, they keep saying, "This one will be a piece of cake after your heart surgery." Not true. I think nature has a way of protecting you from very traumatic things. I was so out of it for so long with the heart surgery that I recall very little. Nature allows you to experience the smaller surgeries! I remember most every darn thing about this one! The aneurysm turned out to be quite a bit larger than they thought, and they really ticked off my femoral nerve root bundle. They say that they don't think they permanently damaged it, but that they don't have any way of really knowing. I'm back to not walking again. Well, I can hobble with my back bent over, and I do... to get from point A to point B. I'm in no pain unless I move! When I move, a lightning sharp pain shoots down my leg. I'll tell you-- I can recall this, every darn time! I've not felt such pain in my life. Not even with the heart surgery! I'd like to just not move, but darnit anyhow I want a glass of water, or a new book, so I have to move! I checked into the motel the night before. I had a leisurely stay and woke at 5 the next morning. As usual, nothing to eat or drink after dinner. I was starved and thirsty! My sister Linda showed up to be with me before surgery. Then Pete stopped by just before they gave me a bit of Versaid and wheeled me off to surgery by 7:30. I was in la la land. I woke at 9:30 or so, and felt just fine. I drank water and held it down. No pain that I can recall. I was just SO hungry! They couldn't find me a room, so I had to stay in the recovery area. That's depressing! Lots of folks sick, and in pain. I was still hungry. They couldn't feed me in the recovery room, and all they had access to there, was ice water. I drank my share! They finally ordered me a box lunch after being in the recovery room for three hours, and still could find no permanent room. Why would they schedule me for surgery if they didn't have room? Argh. The box lunch did not (ever) show up. The hours passed slowly as my stomach growled with hunger. It was 1 O'clock, 2, 3, and 4! Still no room, still no "box lunch!" Finally, at 5, I was taken to a room. It was a very lovely room, although it was on the same floor with the same nurses as my heart surgery. That was a little freaky to me. Memories and a little bit of fear crossed over me. I complained yet again of hunger. They promised a box lunch. Argh! Finally, I was served dinner like all of the other patients. A tiny piece of meatloaf and some very heavy fake mashed potatoes, but oh was it good! I could have eaten card board at that time, and maybe it was... but it was good cardboard! After that, Linda stopped by and wheeled me around outside. We were rebels, running away from the hospital, and we had a good time. Uh oh. Night time. The local had worn off, and man oh man, I had PAIN! They gave me morphine. They gave me all kinds of pain pills, and I hurt worse and worse! They kept trying different drugs and combinations, but I could not kill the pain. Then, a migraine came on, and I have never felt such an awfull headache. I was up all night. I didn't sleep a wink. At 3 in the morning, I got in my wheelchair and went for a spin. I just couldn't lay there any longer. I toured the hospital floor by floor. I was antsy and nervous and in pain. I asked for ice several times, but somehow never got it. My nurse, who was very kind, was working a double shift and it showed. He forgot most everything I asked for. Double shifts are not good for nurses, I am convinced! He was so sweet and caring. He just forgot stuff. He reminded me of a waitress, going from room to room taking orders, but not writing them down. He got about half of the orders right. The next day they took out the drain. I was afraid that would hurt. It didn't hurt very badly at all. It was a 2 inch or so piece of plastic, like a straw pushed into my leg in a small hole. They just pulled it out! I wasn't draining anymore, so that was good. I begged to go home, even though they wanted me to stay in the hospital to help control my pain. I just wanted to be home with my dog. They finally gave me permission. Bill came to pick me up. Riding home, I thought Bill was seeking out every bump in the road just to torture me. It's funny how you don't pay attention to rough roads until you are in pain! So, here I am... recovering. Last night my incision swelled way up and looked very angry and red. I had a fever. Back into the hospital I went. They sent me home, though! Yay! It's not infected. It's just red and irritated. They called it "reactive." Yes, I don't blame it for being reactive. I am, too! I'm on the road to recovery, and all I can do is to pray that my nerve damage will go away, and I will be able to walk again. I want to walk to the river. Presently, that's not possible. I did, however, walk up the stairs a bit ago! So, we'll call that progress for the day. Baby steps and a positive outlook are my medications. Now, off to read in the sunshine! Those of you who think you should be in Palm Springs or some sunny tropical island somewhere should take a look around you. You are there! Right here at home, in beautiful sunshiny Oregon! It all started as I was recovering from my first surgery in December. I longed for warmer weather. Winter coated the branches of the trees with frost every morning. It stayed frozen, nearly all day long. Frozen and dark with long, winter shadows. Although no one had diagnosed me as such, I had no blood flow to my legs. I felt as cold as those barren branches! I wore foot warmers, sheepskin slippers and my exotherms from USIA nearly constantly. I sat in my wheelchair and watched for sunshine on the meadow. At first, it barely danced at the edges, and only for a brief flash of time. Soon, I had it memorized. The sun hit the back deck precisely at 1:00 PM. If I wheeled myself out at just the right time, I could soak up 30 minutes of wonderful sunshine on the deck! It felt so good as my limbs began to thaw. Now, two additional surgeries later, it's as if those days were months ago, I have full sunshine on the deck nearly the entire day, and it's not the spring sunshine that you'd expect. It's not the kind of sunshine that requires a sweatshirt and jeans. It's all out summer sunshine in the seventies, and it lasts all day! I have tan lines from my swim suit! Now, that is amazing! The blood flow has returned to my legs, and I am in sync with the season. Equally amazing and semi controversial around here, is the absence of steelhead throughout this period. I have been sick since the end of Fall Chinook season. The run expired as my heart gave out. Since then, not one run of fish have we been able to depend on. Some say in a joking manner that the cause is my sickness. That since I can't fish, the fish have not come. In a selfish way, I find myself almost sighing in relief at their absence. I simply don't know how I would have handled the situation if Bill routinely walked in the door after fishing with a limit of steelhead, or even a single shiny chrome springer. The poor run of fish has helped me to feel a little better. I haven't really been missing out. But now the test is upon me. It happened on Bill's birthday. You'd think the beautiful spice cake I made for him would be enough. Or perhaps the colorful packages that I wrapped carefully, containing items that he wished for. But, no! NO! On his Birthday, he came smirking into the house, and stated, "I caught my limit of birthday fish!" It's not often... in fact, it has never happened that Bill's first steelhead of the season came so late. 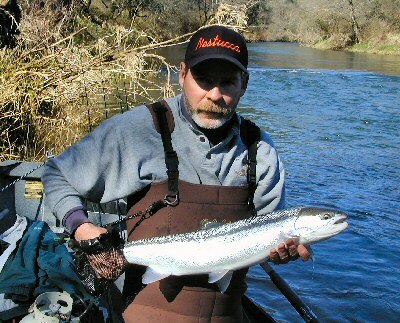 By now, usually, he has several steelhead notches in his belt. Usually, memories of several float trips dance in our winter dreams. Not this year! This year the drift boat was taken out only once, and on that day, no fish came out to play. I was not part of the day's fun. I was home in my exotherms, waiting for the sunshine to warm me on the deck. I still can't walk well, and the pain of this surgery continues. Not quite as badly as the first few days, but painful, nonetheless. I walked hunched over. Every day, though, the degree of hunch rises. Soon, I'll be walking! There are steelhead in the deep pockets of the coastal rivers. It's time to rise, and be well! I have so few days left in this month to catch at least one steelhead, and then I have very few weeks after that to get into shape for our coastal spring chinook season! It is a new day. It is filled with hope, and visions of chrome chinook! I am looking at the end of my period of convalescence. You know, in a way it was kind of fun. I needed it. I have been going too fast, for too long. Long lazy days of simply waiting for and reveling in the sunshine have been relaxing. I've had time to think, to rest, to feel the sunshine on my bare legs. I only wish that I didn't have to be so terribly ill, to learn to enjoy these things more often. Perhaps there lies a lesson that we could all benefit from. I have a feeling that spring chinook season is going to be awesome this year. It's going to coincide with me feeling awesome, and well, and healthy! Yes, I may have to hand them off... but no one said I can't feel the bite! I know many, many people who would be more than glad to help me with the 'dirty work' of playing those fish to the boat. I'm going to buy a new digital camera, and be the photographer this year! I'm looking forward to that. It's the new game of hooking the fish, handing it off, and taking pics! So look out, ladies and gents. I'm on the mend! Fear not, all of you who are wondering where the fish are. I am well! You all know what this means, right? The fish are coming back with a vengeance! The doc said "two weeks", not six days. I have to keep reminding myself of that. I'm having trouble trying to be well, and seem to lack any energy. I woke up this morning, and in an effort to be well, took a shower, and put on nice clothes. Usually that helps me to get with it. Today? Even though I'm dressed up and pretty, the bed keeps calling my name! How I'd love to lay down, just for a second! Yesterday was a lovely day, regardless. As much as I love the warm sunshine, I was relieved to wake up to a day cloudy and stormy. The wind blew nearly 50 mph! Our pear trees are in full bloom, and when the wind hit them, the back yard turned into a snow storm! I had to look twice, and check the temperature! Nope, it's not snow! It's the pear blossoms! Our Mason bees have hatched out of their tubes and have been really working on pollinating things. I hope we have a good crop of Asian pears, like last year. That was really fun! The fruit was huge! David left his bedroom window wide open. As I was working on ifish, I heard a tremendous crash! I searched the house over, and it wasn't until I got to his room that I discovered the culprit. What a mess! Believe it or not, worse than usual! It looked like a real tornado had hit his room! His boom box was on the floor, with D cell batteries, everywhere! Papers scattered everywhere! I just simply closed his window and walked out. Not my problem! With the rain expected this week, perhaps the rivers and fish will benefit and perhaps revitalize. I sure hope so. It will do well for the incoming springers, too! I have heard that quite a few miles out in the ocean, there are springers everywhere! Man, as much as I don't care for fishing the ocean, at this point in my fishless life, it's tempting! I'm also hungry for some ling cod. I'm looking forward to trying small herring along the jetty for lings. I have accidentally caught quite a few lings fishing this way, while targeting springers. It only makes sense to me that if I reduce the size of my herring, I'd get more, right? Truth be told, there are many days I'd prefer a ling on my table, to a springer. Call me spoiled! I just love ling! Well, off I go. Another cup of coffee? Will that widen my eyes? Two weeks, huh? I'm counting the days! For now, Kilchis is looking at me all sad eyed, and I know what he craves. The river. It is not raining. I guess I can muster the strength to do that! "Come on, Kilch! Let's go!" Saturday... and the wind storms are coming and the rain is back. If you didn't know better, the incredible and unending month of sunshine didn't exist- except for the low, clear waters of the coastal rivers. I wonder if the incoming rain will wipe away that evidence, also. I hope so. I hope that the footprints on the beach are wiped clean. That the holes that Kilchis dug will be filled. I hope the moss that is forming on the rocks is washed away. I hope that the shallow riffles become full with heavy current, and the rocks that jut out of the shallows will be covered. I hope that the white frills of water will thicken and turn to a muddy slur. I hope that all the sticks and logs and loose debris will be washed to the ocean. ...and along with all of these things, I hope it will take my sickness, and leave me with only a distant memory of what it was like. An appreciation for what is new and what is possible. I'm ready to wipe this slate clean. I'm going to stand in the pouring rain and have it cleanse me. I want the winds to hit me so hard that it breathes through me and whisks away all these memories of surgeries like a can of air spray cleans my keyboard! LOL... That's how I feel, darnit. And if the wind doesn't come as predicted, I am going to use my darn can of air spray! Yesterday at the doctors, my blood pressure was so low that they didn't know how I was standing up. I get to quit my blood pressure medicine! Or, I have to! The bottom number (diastolic) was 37! "May you rest in peace, Jen!" Maybe this is a sign that my heart is recovering? I wonder when everything will balance out. I glance at all the pills and wonder how I will ever possibly get used to taking them all? I have a medicine container. Weekly, (weakly?) I sit down to calculate my morning and night time doses. I believe I am on over 10 medications a day. That couldn't be right. What if I just quit them all? I do. I do want the rain and the wind to come and clean all of these chemicals out of me. I almost believe that is why I feel so badly. It must make my liver quiver! Blood thinners, beta blockers, blood pressure medicine... be gone! I wish I were brave enough to just say no to drugs! But, for now, the rain falls ever so slightly on the rooftop and although it's soggy out, everything is still sitting quietly, and slowly... ever so slowly, building muddy, dirty puddles in the driveway. I want a lake! A rushing roaring river to the sea! Yesterday I drove out to the Memaloose boat ramp. Nearly a mile before the parking lot, a sign stands like a ghost, saying, "Fee use parking starts here." There are days when the lot is so full that people have to park their rigs that far away! Really! Finally to the vacant lot, my motor idled as I sat, staring at the high tide. I unrolled the window and felt a breeze ruffle my hair. It took me back to long days in the boat, reaching my rod tip out to feel the lead weight searching the bottom of the mud slicked bay. Searching- for that elusive springer! Searching- for a way to be well. I am so darn sick of sick! I continued to stare at the lonesome expanse of bay before me. I wondered if I might see a fish jump. Hope... oh eternal hope! Please! Some sign that I could return to the "hunt"! Some sign that means I can start new, and return to the life that had me fishing daily! Not a thought of hospitals or doctors or pill containers even close to my mind! I think it's coming... I can feel it in the air. The barometer is dropping and the wind is building offshore. I can feel a slight breeze of anticipation for what is new, what is possible. Springers and Memaloose, I'm coming home! Andrew is off with his Dad, and his sugar glider, Phoebe seems ill. What in the heck do you do with a sick sugar glider? I haven't been able to sleep, and Phoebe won't eat anything, and seems listless. Oh boy! Motherhood! Andrew loves this creature so much! I have a great responsibility, here! Yesterday I caught my first steelhead of the season! Can you believe that? I was so excited! However, I tried really hard to be "not" excited so that I could have fun and finish the fight. I have been fishing in small 15 minute intervals, hoping to regain some strength. Even when I don't want to go, I force myself. Well, I am sure glad I did! I caught a steelhead! Whooo hoooo! Sometimes it is so difficult to get out there and fish. Getting well is frustrating, and darn hard work, but it's paying off! I do believe it is! I have heard it said that there is a six month period of depression after heart surgery. I believe that, too! It's something about the heart and lung machine, or breaking the sack the heart is in. Whatever it is, my counselor says that it happens to most heart patients. Two days ago, I felt this fleeting feeling of happiness that had evaded me for the most part, for months. It felt SO good! To me, it was like a sign that things are going to look up... to return to normal, and that I will be happy again! Happy and healthy and hopeful! Last night, Bill even made me laugh so hard that it hurt! The happy feeling happened first, after a fishing outing. I came back in the house, and I had fished... just like old times. There have been moments of concern for me, as I wondered if I had lost interest in fishing and anything and everything. Had my joy been robbed from me? Was my spirit crushed? My rods hung on the wall uncared for, almost unnoticed, for months. My painting supplies stayed in their boxes. Well? I had heart surgery! I excused myself. Anyhow... I'm getting back in the routine, and no, I have not lost my interest for fishing! In fact, it's my first love. It's frustrating to lose the ability to do what you love. Last night I watched a very sad show about our soldiers losing their limbs and going through rehab. Oh! Could I ever feel their pain! Someone said, "It took me months to look at the stump where my leg used to be. Then, when I did look, it was a very difficult day. I had to look into the mirror and see that it was indeed me with that stump!" I can relate to that, too! Sometimes, I can barely believe that this happened to me. It has. And it has been a very good teacher for me. I have learned some very valuable lessons about life, about endurance, and about patience. I'm not the type of person that does things a little at a time. But healing is a process that happens a little at a time, and I have no control over that! And so, watch me... Doing things a little at a time, now! The recent storms have brought the river to fishable levels again. My Loomis rod was still rigged with a pink clown corky, just as I had left it at the beginning of the season. My Calcutta felt smooth and heavy, but oh so natural in my hand. I cast, with memories of so many, many casts of the past. My line dropped into the same current, and the same river bottom greeted me, with the same rocks, the same soft pull, the same bump, bump, bump. Fishing was a milestone for me, and brought me a touch of happiness that has seemed to me a distant memory. I have been alright, but that feeling of euphoria had escaped me. I didn't catch any fish that day, but I caught the bug of happiness and it's gave me faith that I'm coming home. The next day, I caught my fish. What greater gift is there? Happiness or a fish? And now... back to the sick sugar glider. Sigh. I just have to ask this, because I keep forgetting, and it's on my mind alot. I've lost track of a friend of mine, Gary Winters. He used to be a chef at Neawanna by the Sea, and also worked at the Youth Prison in Warrenton. We went to Disneyworld together, and he named me mayor of Disney! It keeps coming back up in my mind. I really want to talk to him, and I have no idea how to get ahold of him. Does anyone out there in the world wide web know him? I'd love an e mail, if you do! Bill wants me to go fishing, today... in the boat. I don't know why, but that seems like a big step. I'm still a bit weak, and I'm so afraid I'll get in the boat and then want to go home and won't be able to. Sounds weird, I know, but I do poop out quite fast. Besides that, I am doing so well here at home, fishing! Yesterday, I caught two steelhead, and got four bites. When I get a bite, I can't hit them to set the hook like I used to, so I miss more fish. Thing is, I don't know if I can hit them like I used to, but I'm not in the mood to find out! I more or less just pull back, and hope the hook digs in enough to bring the fish in. I do this more than once. Gentle pulls that set the hook deeper into wherever it set. I sure am getting more hook ups since I have adjusted where the line is tied to the hook. I tie it to the eye as usual, and then slide the knot down so that it comes off at a 90 degree angle to the jig. This not only helps me snag up less, but it seems to help me set the hook with more consistency. I've also found that more is not better. In these low water conditions, just a tip of a shrimp tail is all that is needed. If you add a whole shrimp, it looks lively and wonderful, but I think it scares the fish. They are more apt to bite if you only add a tip. A little dab will do ya! I feel pressure to fish in the boat with Bill, and I almost cringe when he asks. It's a lose lose proposition. I feel bad saying no, and I'm afraid I'll feel bad if I have to cut the trip short. So, when he tells me that he's fishing with friends, and it leaves me out, I'm almost relieved! Not only that, but 9 times out of 10 he comes home skunked, and I've been playing fish all day long! Giggle! I only have so few days left to fish the Kilchis before it closes. My heart sinks every year when April gets near. April... and the river is closed. CLOSED! No fishing at all! Yet, every year when it happens, Kilchis whines to go down to the river, anyhow. I go, and I am forced to rediscover so many amazing things about the river that I have missed, with rod in hand, and fish on the brain. The otters, the dippers, my "hilariously happy" bird that sings a song so beautiful that it stuns me. He's there, every year. He sits across the river from me and sings such a melodious song! It really is a hilariously beautiful and happy song! The range of his song is huge and varying. I think it's a dipper, but with my eyesight, I can't be sure. He's been there, lately, but I'm too busy concentrating on fish to notice, much. Soon, I'll be forced to listen! There are crawdads, and agates, and lures left in the rocks to discover! If I'm lucky, I'll also notice the bees nests being built, so that once fly fishing opens, I'll know where to not swing my fly on the back cast! It could be a very long and tedious wait until fly fishing opens. Instead, rediscovering the Kilchis river for all of it's beauty and depth of character gives me a deep appreciation for the gift I've been given, of residing here. I'm only a guest, here, and my time is so precious! What a waste it would be, to not take this time to uncover some of the amazing secrets it holds. It's time to start the gardens, to plant the flower baskets, and to watch the spring storms transition us to summer. Time slows down as each unsettled weather pattern passes over us. It's time to tell Bill that I want to stay home to fish. I hope he takes it well. Maybe he'll join me, and see just what he has been missing out on! By the way, "Phoebe" the sugar glider seems to be well, and Andrew is taking good care of her. That was scary! She still won't take a worm from me like she used to, and I don't understand that. But, Andrew is convinced that she is fine, so that's good enough for me! You all have a great day. Looks like sunshine, before the storms hit, tomorrow. I have more to be thankful for, than anyone I know. I can count the scars on my body, and there are many. Three on my right leg, and two on my left. Several on both arms, and one that is like an upside down T on my chest. Underneath and around these spots, it is totally numb. I'm still getting used to that. I don't know if the feeling will ever come back. My left toes are all numb, too. I see all of these things as evidence that Jesus Christ loves me and has performed miracles for my family. I have been singing songs of Easter all morning, and no where have I heard more exuberant, more joyful tunes. It hits me so hard that I've cried tears of joy, this morning. I am really, really alive! It's a miracle! But, what's more than that, is Jesus Christ is alive, and has risen! I kind of feel similar to that! The doctors say I came so close to death. I can remember them cheering me on-- "Jennie, this is the hard part! You can make it through this! Come on, Jen!" I heard them chanting. I think I was supposed to be asleep, but I remember every darn thing about it. I had to be reminded that yes, indeed, miracles can happen. Yes, indeed, God is with me, and I can make it through this! I remember feeling like I just wanted to give up, to go to sleep. But, I'm alive! And to prove it, I'm going to go put on my rain slicker and my boots, and go stomp around on the flooded river beach. I'm going to splash in the puddles and sing Easter songs! It's an absolute miracle. So far, I I have yet to lose my ability to play the piano. I'm sure it's just a blessing, plain and simple. It is so strange that after four months I can sit down and play, and still have pieces memorized after forty years! Sheesh! One thing I know for sure. This isn't me, or any of my doing! It is a blessing, pure and simple. -A gift from God! I don't own it, nor do I have anything to do with it. I am honored, though, to be the one who has been blessed with this gift! I am so totally humbled by it! I'm thrilled by it! Wow! You should listen! It amazes me! I don't really feel well enough to travel, but I have no choice. I have to go! Ah... the mystery of it all! It's blustery, rainy and cold outside. Most surely a day to cuddle up, light some candles and play piano. I have physical therapy later, and I feel so blessed to be able to go. I am so stiff, and have much trouble moving about like I feel like I might be able, given proper exercise and training. I can't even sit cross legged, anymore. I have marfan! I am supposed to be limber! I used to be so limber, I could bend over backwards without effort! I am doing a bit of home based yoga, and that seems to be helping. I can lower my blood pressure in minutes! It's cool! I wish I could fish, but the river is still high and muddy. Like I said, a day for candles, a bit of piano playing, and a course in physical therapy. It's a soup kind of day. Think I'll put on a chicken to make some stock. I made an excellent swedish pastry yesterday, thanks to Sea N Go's wife's recipe. It is so good! I was amazed that even I could make that! Off I go-- Have a wonderful spring day! That old unsettled weather pattern that Oregon is famous for is making me feel much more at home than that odd sunshine that glazed our "daze" for nearly a month. Increasingly, since my surgery, I am learning to sleep, again. The better I get at it, the more I want to sleep. I want to sleep starting right after dinner, then go upstairs and sleep some more... Then, when the alarm goes off at 5 in the morning, I want to sleep more. I must have an awful lot of sleep to catch up on! All I know is that I adore sleep! Peaceful, restful, zombie like sleep! It is wonderful, and a new thing to be thankful for! For weeks and even months, I couldn't sleep for one reason (surgery) or another. Until lately, I didn't sleep a whole night through since December 9th, that fateful day when I held my hand to my chest and told Bill to dial 911. This week is a ridiculously crazy, busy week. One made for people that didn't just have four surgeries! I had a root canal, or half of one, yesterday. They couldn't finish it in two hours, so I need to go back. It is so wonderful to have no pain there, though. Whoo hoo! I can drink cold water, again! This morning I have another doctor's appointment, and then I can't wait to have my hair done, again. I am still losing a bit of hair, but mostly, it is growing back, and that's exciting. I'm thankful I have some "hair" to be done! Then, I have the rest of the day to rest, and catch up on ifish. We are doing a little bit of a fund raiser this year, to pay for new RAM and a slave server to be built, for searches on the board, only. That will help, so much! The board will be shut down for five minutes, today to reset things. Things should slow a bit as we rebuild our cache, yet again, but then it should settle in and get zippy! The river is still murky, but clearing. It's plunkable at this level. The Wilson was clearing very high up, but still very muddy/murky down in town. Tomorrow, without much rain and with a lot of hope, I should be able to toss a line, before I go out of town on Friday! Well, off I go. You know, I can't wait for after dinner, tonight. That's when I get to sleep again. What a gift! I have to leave to go out of town, soon. Phoebe is still sick, so I'm dropping her off at the vet's in Portland. I took her to a local vet, but she, of course, has to be seen by a specialty vet. So, Phoebe will be hand fed, to try to get over a ketosis in her urine. Hahsheeshhhhhhh. I just had to do a chipmunk rescue. I heard a terrible screaming. I went to the kitchen to find a chipmunk hanging live out of Molly Mae's mouth. Luckily, I got her to drop it. Cornered the chipper in the bathroom, until I got Molly out of the house. The release went well. Little chippy ran out the door, turned around, chipped at me, "thank you!" and scurried away! Well, as I said. I'm rushed, and not liking it. This is the last day that the Kilchis river is open. A local guide just went down and reported doing very well. Just my luck! Maybe I can get a cast or two in, before leaving? I hope so! So, it's off to my sister's for dinner and an overnight. She's putting me in the "sheep" room at her farm. She has three animal rooms. One horse, one sheep and one goat, I think? Anyway... I get the sheep room. Fun! She's an excellent cook, and I bet anything I'll be treated to a wonderful dinner! I can't wait! Then, it's overnight and up early to catch my flight out of here. I can't wait to tell all! I hope you have a wonderful weekend. I hope the rivers clear and the springer of your life "springs" to life, in front of you! I'm going to leave this link, here in case I need to update you on something, or just feel like writing, in general. Check it if you feel so inclined. :) For now, I better hurry!